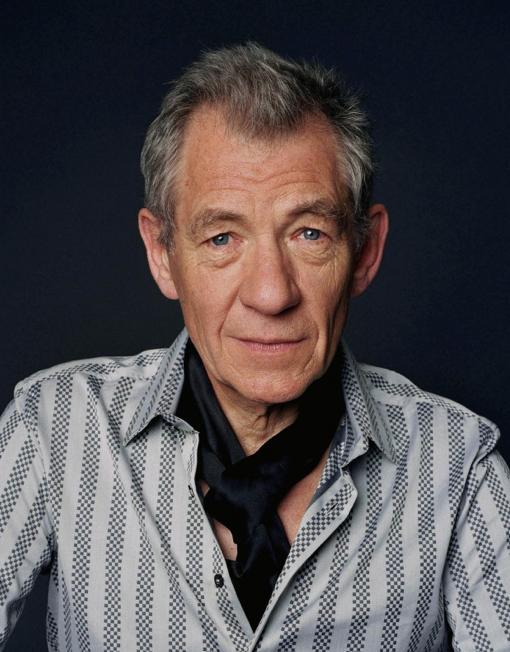 Ian Murray McKellen was born on 25 May 1939, in Burnley, England Just before the outbreak of the Second World War, the family moved to Wigan, a coal-mining town in south Lancashire. In his earliest years, Ian slept under the iron bomb-proof table in the dining-room. An early fascination with theatre was encouraged by Ian’s parents, who took him on a family outing to Peter Pan at Manchester Opera House when he was three. His sister took him to his first Shakespeare, Twelfth Night, by the amateurs of Wigan’s Little Theatre, shortly followed by their Macbeth and Wigan High School for Girls’ production of A Midsummer Night’s Dream. Sir Ian enjoyed acting at all his schools, most crucially for Frank Greene, the senior English master at Bolton School. Bolton School, where McKellen was a scholar, further encouraged the tyro actor at the Hopefield Miniature Theatre. While at Cambridge McKellen was a member of the Marlowe Society, appearing in Henry IV (as Shallow). His first professional appearance was in 1961 at the Nottingham Playhouse, as Roper in A Man for All Seasons. In 1965 he was a member of Laurence Olivier’s National Theatre Company at the Old Vic, which led to rôles at the Chichester Festival. In the 1970s and 1980s McKellen became a well-known figure in British theatre, performing frequently at the Royal Shakespeare Company and the Royal National Theater where he played several leading Shakespearean rôles, including the titular part in Macbeth, and Iago in Othello. In 2007 he returned to the Royal Shakespeare Company in sell-out productions of King Lear and The Seagull. In 2009 he appeared in a very popular revival of Waiting for Godot at London’s Haymarket Theater, directed by Sean Mathias and playing opposite Patrick Stewart. Sir Ian is President and Patron of the Little Theatre Guild of Great Britain, an association of amateur theater organizations throughout the UK. In 1988, he publicly came out as a gay man during a BBC Radio 3 discussion about the Thatcher government’s infamous “Section 28” of the Local Government Act, making illegal the public “promotion of homosexuality.” He overnight became an active member of the movement to change those UK laws which discriminate against lesbians and gay men. He is a co-founder of “Stonewall” which works for social and legal equality. In 1998 he was appointed to the board of the Royal National Theatre Comapny. Sir Ian has also performed in film roles throughout his career beginning in 1969 with his role of George Matthews in A Touch of Love. However, it was not until the 1990s that he became more widely recognized in this medium, through several roles in blockbuster Hollywood movies including Six Degrees of Separation, and Richard III. He was nominated for the Academy Award for Best Actor for his role in the 1998 film God and Monsters , for the role of James Whale, the gay director of Show Boat and Frankenstein. The 2000s proved just as busy for Sir Ian who appeared as Magneto in the X-Men movies and, of course, in the role of Gandalf in all three movies of The Lord of the Rings, and is now set to reprise that role in The Hobbit.